Apple's original iPhone popularized the accelerometer, a type of sensor that can detect a device's acceleration, shake, vibration shock, or fall by detecting linear acceleration along one of three x, y and z axes: up/down; right/left and front/back. The company had earlier used accelerometers in its notebooks as "Sudden Motion Sensors" in order to park the hard drive in anticipation of hitting the floor, to avoid hard drive damage related to a drop. On the iPhone and iPod touch (and recent iPod nanos), 3-axis accelerometers enable landscape/portrait orientation switching, tilt control for games, and shake features such as undo and song shuffle. Because they only measure linear motion, they can't sense compass direction or subtle twisting motions or rotation about gravity. In the iPhone 3GS, Apple added a digital compass (magnetometer), which can additionally sense magnetic direction relative to the Earth's poles. 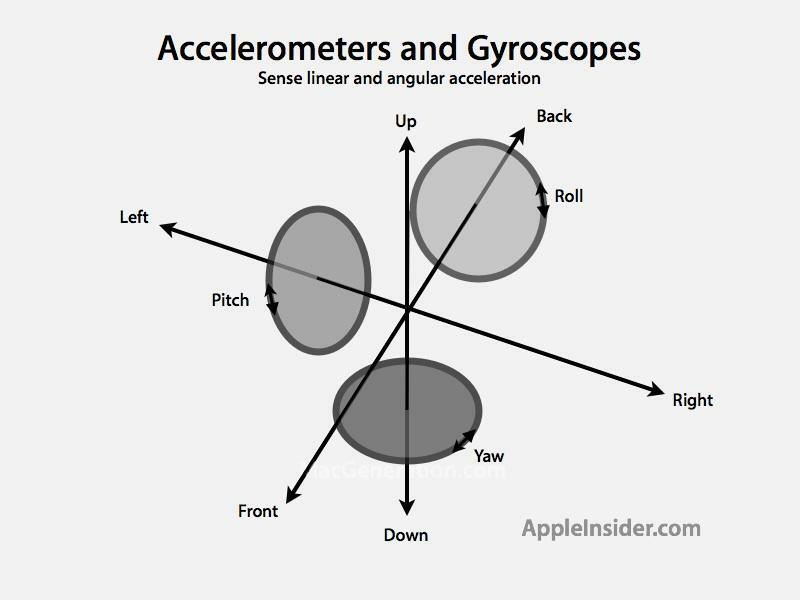 The iPhone 4 gyroscope adds an additional new electronic sensor for detecting 3-axis angular acceleration around the X, Y and Z axes, enabling precise calculation of pitch, yaw and roll. While conventional accelerometers measure linear acceleration as a change in velocity (speed increasing or decreasing over time) apart a change of direction, a gyro measures angular acceleration: a change in both velocity and direction at the same time. In iPhone 4, the gyro enables the device to sense slight degrees of rotation while rejecting linear movements and hand jitters, while its accelerometer senses those linear movements. Combined with data from the accelerometer and compass, the gyro provides detailed, precise information about the device's six-axis movement in space: the 3 axes of the gyro, combined with the 3 axes of the accelerometer enable the device to recognize how far, fast, and in which direction it has moved in space. Apple makes this information available to developers through new CoreMotion APIs, sparing them the need to be experts in physics just to add gyro support to their apps.